Canker sore patch relieves discomfort and promotes healing. 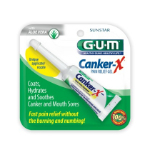 Made with natural menthol, DenTek Canker Cover provides soothing relief of canker sores and other minor irritations of the mouth and gums. By forming a gel bandage, the Canker Cover patch protects against further irritation and promotes healing. Place the Canker Cover patch on a clean, dry finger with the white side up. The sore should be dry (pat with tissue, if possible). Place the white side of the tablet on the sore and hold in place for 20 seconds. If sore is difficult to reach (in the fold between the cheek and gum or near the teeth or lip) break the patch along the score and use half. Some discomfort may occur during the first few minutes for a small number of users, but will quickly subside followed by hours of soothing relief. Within 30 minutes the tablet becomes a clear, gel-like patch that will cover the sore for 8-12 hours before dissolving. Do not remove the patch before it dissolves. In case of discomfort, the patch may be removed by gently peeling the tablet from the sides while washing with warm water. Do not use any instrument to remove the patch. If needed, apply a second patch 24 hours after the first application.